Are you sick and tired of looking at models and can’t make up your mind? It’s okay we’ve all been there but good news you’ve finally found the correct place. I have spent hours to review and compare the finest models out there under $200 and find the best in this price class. I hope that you find this article helpful. Please consider sharing this article to help others too! Read on to see full review of these models and others in this price class. Now get this: Makita is an innovation leader, over the years they have earned the trust of professional users internationally. Their goal is to deliver the power, performance and durability that contractors demand in any of their products. As in for the XSR01Z, this model it powered by not one but two 18 Volts batteries. Yes, you heard that right! This means you get a total of 36 Volts of power! With this great feature, you get more power, speed and of course more run time! The motor delivers 5,100 revolutions per minute for better performance, and you have a 50% longer time run per charge. If that wasn’t enough to convince you, there’s more. It has a 7 – ¼ inch blade that can cut through anything! The bevel can be set up to 53°, with positive stop at 22.5°, 45° and 53°. In addition to that, it has an electric brake which stops the blade from spinning with the press of a button. If you’re concerned about the batteries, don’t be. This model is powered by Star Protection Computer Control, which warns you when the tool is about to overload, over-discharge or overheat. With this feature you can have the same batteries for years without any issue. But hang on a minute, how is this model better than the Milwaukee 6390-21? As I’ve mentioned above the Makita XSR01Z has an electric brake and unfortunately, the Milwaukee 6390-21 doesn’t. The Makita XSR01Z also has a bevel capacity of 0°- 53° while the Milwaukee 6390-21 can be adjusted from 0°- 50°. The 5007FA by Makita has a 15 Amp motor that delivers 5,800 RPM, this motor brings you great performance and durability. This model has a lower guard design that improves the overall performance when making narrow and bevel cuts. It has a 24T Carbide tipped, 7 – ¼ inch blade that has a large cutting capacity. The bevel can be adjusted up to 45°, making cuts of 1 – ¾ inches and when set at 90°, it can cut 2 – ⅜ inches. Beyond that, it has two built-in L.E.D lights that illuminate your work space, giving you a clearer view of the job or project you’re working on. If you sometimes work in lower light conditions, this feature can increase your visibility and accuracy to ensure you get a high quality finishing touch. It has an electric brake that helps you stop the blade from spinning within seconds. This is a great time-saving safety feature as you don’t want to wait a long time for the blade to stop before putting down the saw safely. It’s also a well-balanced model made for superior handling and better performance. If those are not enough details, then read below! This model has a heavy gauge aluminum wraparound base that’s designed for longer durability and for making straighter cuts. It even has a built-in dust blower, that clears the line of cut for better sight on the cut and thus greater accuracy. It also has a technologically-advanced centrifugal fan and baffle system for efficient cooling of the motor. That’s right, there’s no need to worry about overheating! And another thing, it has a shaft lock for easy blade replacement, and with the help of the flat motor design, this increases stability when changing the blades. I give this model 4 stars, it’s the only model from this review that has both an electric brake and shaft lock and a range of other features. However, it only comes with a 1 year of warranty, which isn’t a lot for a power tool like this. It also has the lowest bevel capacity out of all the models. Go check out the 5007FA by Makita 5007FA here on Amazon. Skilsaw is a great company known for strong and durable products. The SPT77W-01 happens to be one of them. This model has a 15 Amp motor that gives users the power to rip through more lumber in less time. The motor is built with dual copper windings, which increases the copper surface areas by 40% to keep the motor cool during tough cuts. Surprisingly enough this is the only model on this review that’s a worm drive circular saw. Let me take a wild guess, you have absolutely no idea what this means and why it makes this item so special. Before we go any further go check out the article about Worm drive vs hypoid vs sidewinder to learn about the different types of circular saws. 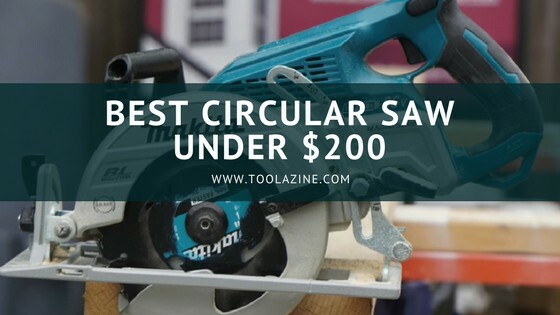 Now after reading all that, you’re probably an expert on the different kinds of circular saws. Now back to this review! This model has a bevel capacity of 51°, with positive stops at 0° and 45°, with this feature you can complete a wider variety of cuts. And that’s not all, the 7- ¼ inch blade has a maximum cutting capacity of 2- ⅜ inches when set at 90°. As in for the design, it’s an overall balanced saw with ergonomic handles that make this saw comfortable to work with all day long. It also has an anti-snag lower guard that protects the blade when not in use and won’t cause any inconveniences while cutting thinner materials. I rate this product with 4.5 stars, it has great features like the spindle lock, that many models don’t have. It also has good customer feedback. But what’s the catch? Sadly this item, like the previous one, only has one year of warranty. Go check out the latest price of the SKILSAW SPT77W-01 here on Amazon. This is my top pick in the corded section and here’s why. To begin with, let me tell you a little about Milwaukee. They produce heavy-duty tools for professionals worldwide, trusted by many contractors as their go-to brand for work power tools! This model has a 15 Amp, 3.25 horsepower motor that delivers 5,800 revolutions per minute. It has a 7 – ¼ inch blade that can be replaced within seconds thanks to the spindle lock. The bevel can be adjusted up to 50°, and cuts 1 – 13/16 inches when set at 45°, 2 – 7/16 inches when set at 90°. With this ease of bevel adjustments, you get a clear line of sight which makes it easy to get an accurate cut every single time. This model has a feature none of the others have, it has a Tilt-Lok handle that can be adjusted to eight different positions that will give you maximum comfort and most importantly control. Want to know the best part? It has an aircraft aluminum shoe and soft-grip handle, that increases comfort. And that’s not all, this model features superior blade visibility from either side. I know that sounds unbelievable! I personally give this item 5 stars, it has great customer reviews that all seem to love the product. And if that somehow isn’t enough to convince you, it comes with a 5 year warranty! Make sure to check out the current price and the customer reviews of the 6390-21 by Milwaukee here on Amazon! Dewalt has been around since 1924 and they continue to design and optimize professional tools that ensure absolute confidence for the toughest jobs conditions. The DWE575 has a 15 Amp motor that can work its way through the toughest cutting applications and delivers 5,200 RPM. The bevel can be set up to 57°, with stops at 45° and 22.5°. Like the rest of these products this one too has a 7 – ¼ inch blade. This item has a great design, it’s one of the lightest models and it’s very easy to work with. You can surely spend the whole day using it and won’t have any complaints about the weight. It also has an integrated dust blower that keeps your line of sight clean and clear, which helps you make straighter and smoother cuts at all times. It has a strong aluminum base and shoe made for smooth movements and accurate cuts. In addition to that it has a lower guard design that provides additional control and helps to prolong the durability of the saw. I give this model 4.5 stars, although it has great features it doesn’t have the most important ones like the electric brake or the spindle lock. It does have outstanding customer feedback so my guess is that all these great features makeup for the ones it doesn’t have. In case you’re still not convinced, this model has a Toughcord system that provides longer durability against cord pull outs. And it comes with 3 years of warranty! The 2731-20 works with Milwaukee’s REDLITHIUM XC 5.0 Batteries together with a power efficient brushless motor, that delivers up to 300 cuts per charge. Isn’t that great? In addition to that, the motor delivers increased cutting speed and can power through the toughest materials! This model works with the REDLINK PLUS system, which is one of the most advanced systems of cordless power tools. It prevents overload by using total system communication between the tool, battery and charger. If you think that’s all this model offers then you’re wrong. This design weighs 40% less than corded saws! I know, that’s crazy! To top it all off, it has LED lights to illuminate your work area in low light situations. It even has a magnesium base plate shoe for longer durability! As in for storage it has a rafter hook for easy storage in-between cuts! Unbelievable, right? This product has a 7 – ¼ inch blade that has a cut depth of 2 – ½ inches. The bevel capacity can be adjusted up to 50°. I give this item 4.5 stars, it has great customer ratings. In general the product has outstanding features but again like the previous model, it doesn’t have an electric brake or spindle lock. But back again on the positive side, it comes with 5 years of warranty! This Dewalt tool works with a new technology they have introduced, it’s the world’s first battery that automatically changes voltage when you change tools. This model runs with 60 Volts batteries which gives users an advantage when it comes to heavy-duty jobs. Yes, you heard that right! That’s not all, these batteries work with Dewalt’s 20V MAX tools so you get up to 4x the run-time, which means you can use this battery with any of your 20 Volts tools. Now most importantly let’s talk about the DCS575B, this model has a brushless motor that works with 60 Volts Lithium Ion batteries, making up to 339 cuts per charge. The motor is maximized for longer run time and durability and delivers 5,800 RPM. The bevel can be set up to 57°, with stops at 45° and 22.5°. The depth of cut at 90° is 2 – 9/16 inches and at 45° it’s 1 – ⅝ inches. It one of the two tools in the cordless section that comes with an electric brake! I give this item 4.5 stars, it has good customer reviews. In addition to that I personally think it’s a great technology that will eventually change the world of power tools. But here’s the deal, it only comes with 3 years of warranty, I honestly think it could be a bit more. As I’ve mentioned before, this is my overall pick and here’s why. The Makita XSR01Z is powered by two 18 Volts Lithium Ion batteries. In total you’ll have a 36 Volts circular saw, which provides more power, speed and run time without the inconvenience of a cord. Yes, it’s true! The motor delivers 5,100 revolutions per minute and can actually run with just one battery! The brushless motor eliminates carbon brushes, which keeps the motor cooler during long hours of work. This model works with an automatic speed change technology that adjusts cutting speed and torque during cuts for better performance. If that wasn’t enough to convince you, I’m sure this will. This model can make up to 558 cuts in a single charge. Now I know that the DEWALT DCS575B works with 60 Volts Lithium Ion batteries but it only makes 339 cuts per charge. The bevel can be adjusted up to 53°, with positive stops at 22.5°, 45° and 53°. It has a depth cut of 2 – 9/16 inches when set at 90°. The saw has a die-cast magnesium base, blade guard and cover for longer durability. Another thing, it has an extra wide hook that secures the tool when not in use. And you know what? It has an electric brake which allows you to make a quick change of blade. If it’s not clear yet, I give this item 5 stars because of the many great features it has. It has good customer reviews and it comes with 3 years of warranty! This model is part of Ryobi’s +One system which features over 100 unique products. It has a brushless motor which ensures longer durability and can deliver 3,800 RPM. This product has a 24T thin kerf carbide- tipped, 7 – ¼ inch blade for maximum cut capacity and blade variety. The bevel has a maximum capacity of 56°, and the depth of cut at 0° is 2 – 7/16 inches, and at 45° it’s 1 – 13/16 inches. As many of these products, this model has LED lights which light up the line of cut and gives you a clearer view of the project. It has a spindle lock which allows you to easily and quickly change the blade with a new one. I give this item 3.5 stars, sadly it doesn’t have many features that make it stand out. In addition to that it doesn’t have an electric brake, which means that the blade continues to spin for a few seconds after each cut, which isn’t very convenient. It does come with 3 years of warranty! Now, I know what you’re probably thinking. What model is the best fit for me from so many options? It’s okay we’ve all been there. But don’t worry with this guide you’ll be able to choose a model in no time! Blade size: conveniently enough all of these models have the same blade size so there’s not much picking in this category but it is very important that you look at this specification when buying a power tool! Power: if you’ve done your research you have probably read that corded products are more powerful than cordless ones. If I’m completely honest with you for some cases this is true but in this review there are some products that are in fact cordless and have proven to be better. So I suggest you think carefully about getting a corded or cordless model! Electric Brake: unfortunately there are only three products with electric brakes in this review, which I personally think is very important. This feature allows you to stop the blade from turning which in fact is a safety feature that could prevent any accidents. I recommend you highly consider this crucial factor when choosing your model! Spindle or Shaft Lock: there are only a few products that have this feature, which to some is very important as it saves you a lot of time when replacing the blade. If you work with circular saws the whole day then you know time is precious so I suggest you look for one that comes with a spindle lock. Warranty: a lot of these products have low warranties such as 1 year, I highly think you should choose one that has minimum 3 years of warranty. This factor should be important when buying any kinds of tools, as some products do come damaged at arrival. Bevel capacity: the bevel capacity determines how high the bevel can be adjusted. The higher the degree, the bigger the cut. So if you know you’re going to be working with large materials then go for a model with a higher bevel capacity. Bevel Stops / Presets: this tells you the angles at which the bevel can be set with the specific size for each cut. If the bevel capacity is higher then the cuts will be larger. Brushed or brushless motor for battery powered tools: Battery powered tools have a limited amount of power in their battery before it needs to be recharged or swapped for a charged one. This means that more power efficient motors can increase the run time or use time for the tool (the circular saw). Brushless motors are more power efficient than brushed motors so if you are comparing cordless tools brushed vs brushless you can expect that with the same amount of battery power the brushed tool will not run as long as a brushless powered tool. What’s the bottom line? These factors should have helped you make up your mind. After taking each one in, you should have figured out which model to buy! At this point you’re ready to go out and buy the best model you have personally chosen. Am I right? Let’s not forget to look at the Buyer’s Guide to make sure this model will completely cover all of your needs. So what does all this mean? The best corded model to get is the Milwaukee 6390-21, this item has great customer reviews and will most definitely exceed your expectations. For my best overall pick, I have chosen the Makita XSR01Z. This product has phenomenal features that will impress you. To sum up, I hope I have achieved my goal to help you choose a circular saw under this respective budget. Remember to look at your specific needs before making a decision. Now go ahead and solve your problem!